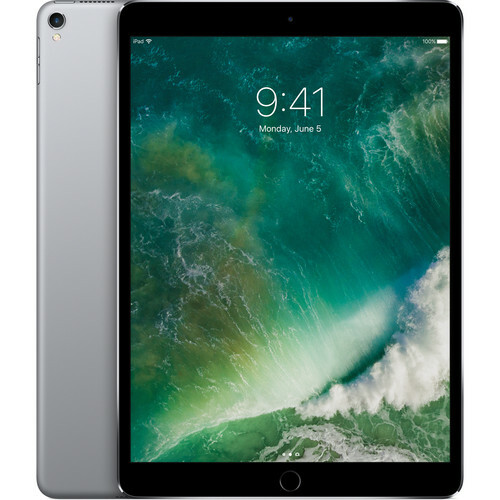 With the introduction of the space gray 10.5" iPad Pro, Apple provides users with 256GB of storage and a 10.5" IPS Retina display that is 20% larger than their 9.7" model, while reducing its border size by nearly 40%. The result is a tablet that weighs just over 1 lb and also features a 12-core GPU, a screen resolution of 2224 x 1668, 264 pixels per inch (ppi), a refresh rate of 120 Hz, a brightness of 600 cd/m2, support for the P3 color gamut, 20 ms latency, and an anti-reflective coating with 1.8% reflectivity. All of this helps to deliver high resolution videos and photos with vivid colors, deep blacks, greater contrast, and more uniform brightness. Powering the large Retina display is the Apple A10X Six-Core chip with a M10 motion coprocessor. This 64-bit chip can pump out desktop-class CPU performance and console-class graphics. The faster performance allows you to multitask with ease using iOS features such as Picture in Picture, Slide Over, and Split View. Also, the iPad Pro is capable of editing 4K video, rendering 3D models/images, creating/editing complex documents and presentations, and playing games. The iPad Pro comes with iOS installed, which features proactive assistance as well as powerful search and improved Siri features, all while protecting your privacy. There are multitasking features designed specifically for iPad which allow you to use multiple apps simultaneously, and built-in apps become more powerful with Notes, detailed transit information in Maps, and the News app. The foundation of iOS is even stronger with software updates that require less space to install and advanced security features to further protect your device. The Apple 10.5" iPad Pro includes a Lightning to USB cable and a USB power adapter. Protection is provided by a limited 1-year warranty, which can be extended using AppleCare. The iPad Pro features a 7MP front and a 12MP rear camera, which are the same as the ones found on the iPhone 7. You'll have advanced optical image stabilization, an ƒ/1.8 aperture, and wide color capture for high quality photos and videos, even in low light environments. The 12MP camera records 4K video at 30 fps, 1080p video at 30 and 60 fps, and 720p video at 30 fps, with slow-mo video support for 1080p at 120 fps and 720p at 240 fps. You can also take 8MP still photos while recording 4K video. It also produces 63MP panoramic photos, has a quad-LED True Tone flash, and can combine multiple exposures for HDR. The 7MP camera records at 1920 x 1080. The iPad Pro has four innovative speakers that produce a stereo soundstage as enveloping as its display. The speaker housings have been machined directly into the unibody enclosure, and their innovative architecture gives the speakers 61% more back volume compared to previous iPad audio designs. You'll hear a wider frequency range and up to three times more output than on any other iPad. The speakers in iPad Pro aren't just high fidelity, they're highly intelligent. While all four produce bass frequencies, the topmost speakers are dedicated to higher frequencies. They also automatically recognize whether the device is in portrait or landscape view. So you'll always get vivid, well-balanced sound no matter how you're holding the iPad Pro. You might expect that such high performance would compromise battery life. But even with its high-resolution Retina display and robust A10X chip, the iPad Pro maintains energy efficiency, providing up to 10 hours of battery life on a single charge (battery life may vary depending on usage). Box Dimensions (LxWxH) 10.4 x 7.3 x 1.9"
10.5" iPad Pro (256GB, Wi-Fi, Space Gray) is rated 4.9 out of 5 by 277. Rated 5 out of 5 by DAB from Great Upgrade I purchased this iPad Pro 10.5 on B & H because they had a $50 off deal plus no tax to my state. They shipped quickly and I revived it within 3 day. The iPad Pro is very fast and the display is super bright and crisp. I am really blown away be the stereo speakers and just how loud they are with no distortion. The size it just a tad bit taller, but no wider due to reduced bezel size. The 2nd gen Touch ID is really quick too. I never thought about taking pictures with an iPad but the cam and flash actually make that a consideration. Very happy with this iPad Pro. Oh and battery life is Amazing. Just get one, you'll be glad you did. Rated 5 out of 5 by Ronald from All I had imagined I have been putting off buying the iPad for a very long time and limping along with rival, cheap tablets. ?I finally had enough of the slow, glitchy rivals and sprung for the iPad Pro. ?I should have done it long ago. ?Fast, beautiful display - it is what I wanted. ?I paired it with a keyboard that uses the keyboard connector rather than bluetooth and it does nearly everything my MacBook can do and be sleeker about it. ?It paired instantly to my wireless printer which surprised me. ?The only con to this is how hard it is to put it down. ? B&H did a suburb job of taking and delivering the order promptly and without hassle. ?It was a great Christmas gift to myself! Rated 5 out of 5 by KWB777 from 10.5 iPad Pro is Excellent I bought the 10.5 iPad Pro to replace a 12 Microsoft Surface Pro 4. Don't get me wrong the Pro 4 is an excellent machine. I bought it at a killer price to try something different than the Apple environment I had been working in the past six years. I just didn't like that it didn't have as many apps available and it's larger size was a little to cumbersome for me. I have had two previous iPad models and loved them and iOS that I have become used to. Anyway, this 10.5 screen is the perfect size for my needs, and the machine itself is a beast. I love that I can take notes, draw pictures, annotate PDFs, and create content. And the best part, I got a good deal from B&H Photo. Rated 5 out of 5 by Anonymous from Very smooth experience Coming from non-Pro iPad, I have to say overall user experience is on a different level. I don't usually care about a little UI stuttering here and there but everything operating buttery smooth gives you extra satisfaction and makes you want to use the device more. .8 inch increase in display size gives you more extra real estate than you might think without sacrificing too much in weight and size. 4GB RAM keeps a lot of background apps in memory so you can go back to it instantly and it contributes the smooth experience greatly. One gripe would be the coating on the display which feels like it attracts more fingerprints and also harder to wipe clean than on older iPads. Rated 5 out of 5 by Ychau from Love my 10.5 iPad I was required to buy an iPad for CRNA school so I researched and ended up with the 10.5 iPad. I absolutely love my iPad! I also have the 2017 iPad and there's a huge difference between the two. The 10.5 is beautiful, excellent resolution and display. It's fast and works well. I also got the Smart Keyboard and Apple Pencil to go with it. They really enhance the device and make it my sole device for school. I've also used it to Netflix and stream things and it's truly a joy. You won't be disappointed with your device. As far as size goes it is slightly bigger than the 9.7 both in screen and size. Even though the screen size is not that much bigger than the 9.7 it is just enough to make a difference. Rated 4 out of 5 by Milkyas G. from Great product! Waiting for the item to arrive, excruciating! This iPad is great, it has just the right size and maximized screen for productivity. It might not replace a laptop but it offers the best alternative as a light weight device for work and play. I use it as a display for DJI drone and editing videos and the graphics is mind blowing. I also use it with the smart keyboard and pencil for an MBA program and it makes note taking very effortless. Instead of taking my work laptop, books, and notepads, I use the iPad to load all case readings, PDF books, and notes. The only issue with using the keyboard, it doesn't stay flat to the surface and it will require getting used to the small keyboard size. Rated 5 out of 5 by DIRSGT from Sound and picture are amazing! This 10.5 iPAD Pro replaces an iPAD Mini 4 that I gave to a family member. While the Mini had a sharp image due to its better 326 PPI/dot pitch the ProMotion refresh rate and TruTone display of the Pro certainly makes up for it. The thinner bezels are a nice touch too. And the sound, the sound is amazing from this device. You can actually hear separation in the music, which is phenomenal. I would just recommend that you try typing without the additional keyboard 1st as I purchased one and rarely use it as typing on the screen works well enough for me. Rated 5 out of 5 by David from Best iPad Yet! The iPad Pro 10.5 has become my daily driver. I use it for almost everything I do during the course of the day. This years model is really fast, the display is incredible with motion flow and full color gambit. I am also impressed by the speakers and how loud and clear they are. I would often times connect bluetooth speakers, but these are so nice I find myself doing that a lot less now. Battery life has also been really, really good. I was also able to get the iPad Pro for $50 off and no tax on B&H. They shipped it very quickly so I am happy with the service. This iPad Pro 10.5 also seems to be the sweet spot size wise with the smaller bezels. It's certainly a keeper for me! Are these iPads brand new? Like they come in with everything and sealed, just like you buy it from the Apple store? The Apple 10.5 iPad Pro is brand new and factory sealed. We are an Authorized Apple Reseller and it would be the same as buying it from the Apple Store directly. What is the Apple Model Number? 2017 or 2018? This iPad is the 2017 model. There is no 2018 model announced at this time. At B&amp;H we always try and have the lowest possible price. And in most cases we have lowest legitimate price on the market. What is required to update from iOS10 to iOS11? The iPad pro is listed on Apple's site of compatible devices that will support iOS11. Will new 10.5 IPad Pro connect to Verizon network? Unfortunately, there is no rebate available at this time. 4G LTE is a data plan option you can get on, so this iPad can be used to access the interwebs with out a WiFi connection.